Here we are already in late May! We harvested the first big batch of mesclun greens from our garden this weekend. They were absolutely beautiful and tasty too. Work has been so busy (did I mention I’m doing 50 cookie photos for a gluten-free cookie cookbook coming out next year?) that life has really been pared down to the essentials, but one thing we always make time for is fresh, local FOOD. In addition to spending a lot of what little free time we have in the garden, my husband and I have embarked on two fascinating food-related field trips in the past month. 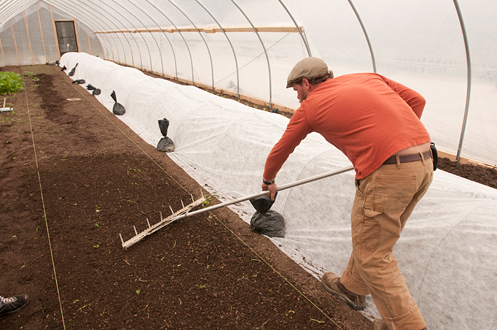 First, in late April we ventured up to Fishbowl Farm in Bowdoinham where we got an inspiring tour and hands-on demo from farmer Chris Cavendish. We’ve bought beautiful produce from Chris at the farmers’ market for several years, but had never actually been to his farm. 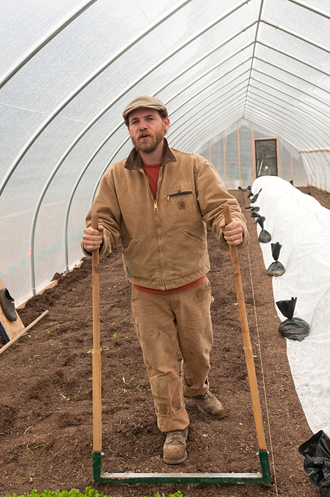 When the opportunity arose to help him plant a bed in one of his new greenhouses, we jumped at the chance to see where and how his lovingly cared for veggies and herbs grow. 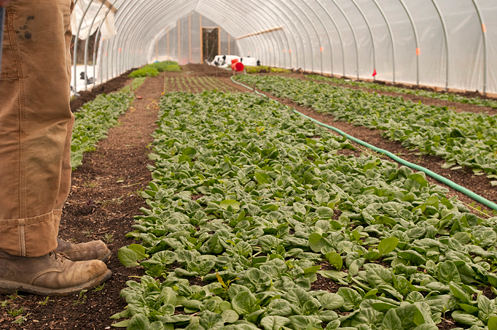 A farmer's feat: happy spinach in one of Fishbowl Farm's snazzy new greenhouses. I think pretty much everyone knows farming is not easy, but how many people have actually witnessed their local farmers at work? 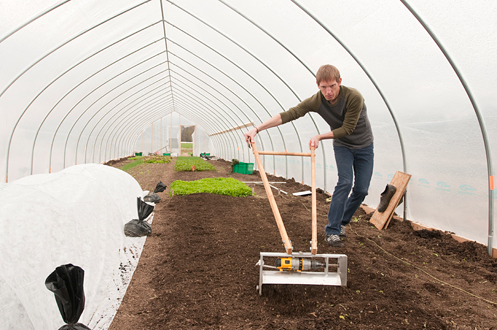 Seeing the steps involved in just planting a small bed of arugula in a greenhouse was so eye-opening. There’s a lot more to it than just digging up some dirt and randomly throwing in the seeds in case you were wondering (even though in our home garden, we don’t do a whole lot more than that!). Trained as an architect, Chris is nothing if not precise. From the systematic watering of seedlings to meticulously cleaning and evening out plots of fertile ground, everything is done a certain way. I had to chuckle a bit when Chris would diplomatically correct Scott’s way of doing something, such as leveling out the soil. ﻿﻿The photos below are probably the best way for you to get a sense of some of the steps involved in planting a bed from seed. Farmer Chris demonstrates how to aerate the soil. After worm castings have been added as a soil supplement, farmer for the morning tills the soil (while being careful not to step on it) with a nifty contraption powered by a power drill. The expert soil leveler shows us how it's done. 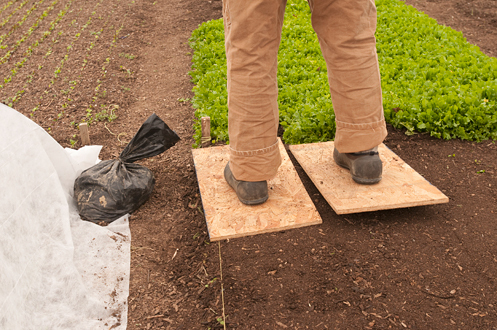 The magic shoe boards make for a compressed, even surface in which to sow seeds. 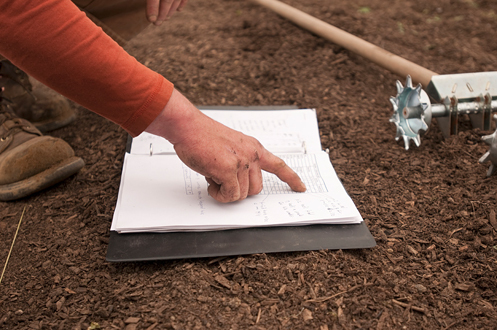 Don't forget to check the chart to see what's next in line for planting! 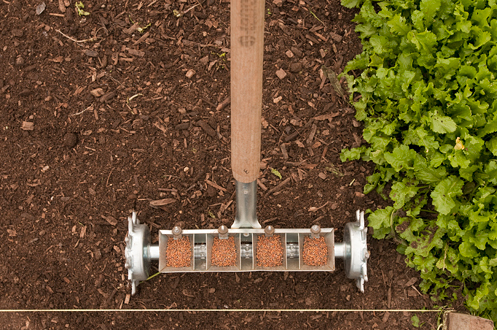 Seeds (in this case arugula) are calculated to evenly disperse in the soil using this pinpoint seeder. Shopping at the farmers’ market is all well and good, but you will appreciate the produce even more if you witness the planning and hard work that goes into each pea you pop into your mouth. If you get the chance, visit one of your farmers on his/her turf and see exactly what goes into growing and cultivating those gorgeous veggies you are eating. I’m guessing they’d be happy to have you take a look around. We’re very grateful to Chris for generously spending his time educating us about a small piece of sustainable farming. (Our garden beds at home are much more even now as a result!) When we saw him at the farmers’ market on Saturday, he informed us “our” arugula was for sale, so I guess we didn’t mess up too badly! 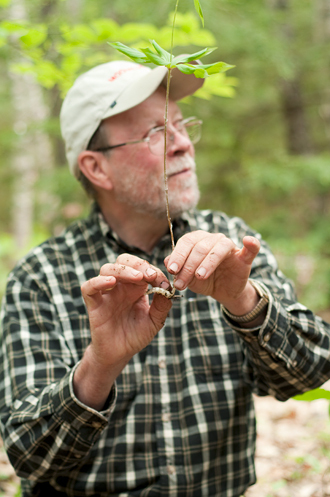 Wild Maine plant expert Tom Seymour with edible wintergreen berries. As you may have guessed from the title of this post, our other field trip involved foraging wild plants. We attended a walk at Crystal Spring Farm with wild plant expert Tom Seymour that was sponsored by the Brunswick Topsham Land Trust. While I’m probably not going to regularly go out and harvest milkweed, cattails and violets—because of taste and texture, as well as the time involved in accumulating enough to make a meal—it was fascinating to learn that these plants, among other commonly found wild vegetation, are edible. Seymour does primarily live off the bounty of the Maine woods (and his garden), claiming to enjoy some of the wild plants so much that he freezes them so he can indulge in the winter. With child-like glee, Seymour described the multiple uses for all these plants in their various stages of development from culinary to medicinal. For instance, the young green shoots of cattails can be peeled to reveal a white inner core that tastes a bit like celery. Later in the season, when the seed buds are green, they can be cooked and eaten like corn on the cob. Finally, the male cattail flowers produce pollen that you can use as a flour substitute (gather it by shaking the flower head into a bag). 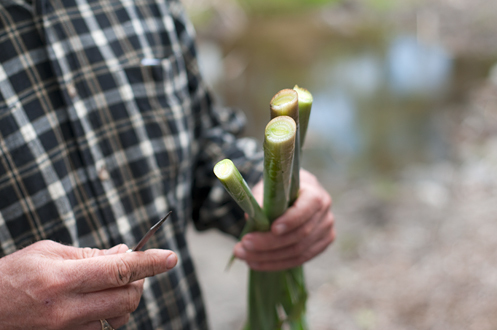 The green outer layers of young cattail shoots can be peeled to reveal a crisp, white, edible interior. The plant with the best taste that we found, in my opinion, is one called Indian cucumber. Its small root has the pleasant taste of a sweet cucumber. Speaking of Indians, I assume it’s them we have to thank for being the guinea pigs with these wild plants. I wonder if it was all a process of trial and error figuring out what could and shouldn’t be eaten. 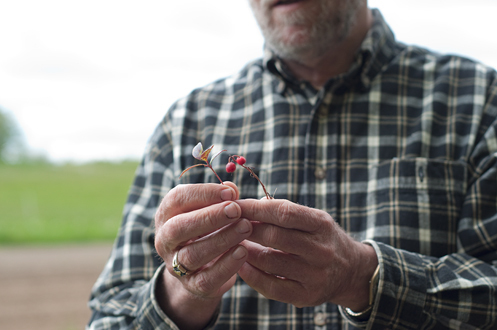 Luckily, there are some good guides out there to help us modern-day foragers locate the right wild plants. Suffice it to say, if I ever find myself in an Into the Wild situation in Maine, I’ll be in good shape—as long as all I have to do all day long is gather food. Seymour holds the lauded Indian cucumber. This entry was posted in food and tagged Brunswick Topsham Land Trust, Chris Cavendish, Crystal Spring Farm, Fishbowl Farm, foraging, gardening, greenhouses, local food, Tom Seymour on May 24, 2010 by Stacey Cramp.